Home » Heart Health » Blood Pressure » What Are the Best Herbs for High Blood Pressure, According to Studies? If you are suffering from hypertension, there are herbs for high blood pressure that may work wonders. Ayurveda and Chinese herbs, in particular, have been known for lowering blood pressure and treating hypertension for thousands of years. Cardamom is an herbal remedy commonly used in Chinese and South Asian cuisine that has been found to lower blood pressure and heart disease risk factors. We will examine the science behind this spice and many other so-called blood pressure herbs. Using natural herbs for blood pressure is attractive to those looking for safer, less costly alternatives to conventional drugs. Be forewarned that, like any type of medication, there may also be side effects to using the following herbal remedies, especially in conjunction with other medications. Here is a list of 20 herbs that could potentially treat hypertension, also known as high blood pressure. Read on to learn more about them. This herb is thought to work because it has high levels of ursolic acid and eugenol, which have been shown to briefly lower hypertension. Eugenol specifically may act as a calcium channel blocker, preventing the mineral from entering the cells of blood vessel walls. 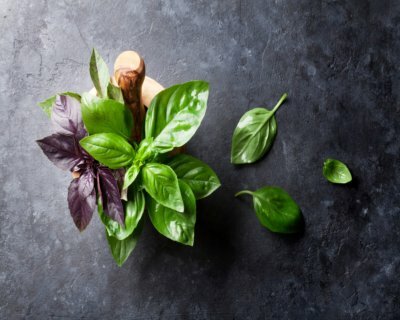 A study of hypertensive rats, published in Hypertension Research, found that a daily dose of sweet basil extract reduced systolic and diastolic blood pressure by about 20 and 15 mmHg, respectively. Fresh basil is delicious, can be grown in your garden, and is readily available at most grocery stores. However, using an extract in pill or liquid form can be more effective due to the higher concentration. A popular addition to a wide variety of foods, from desserts to your morning latte, cinnamon could help lower blood pressure and cholesterol levels, especially in those suffering from diabetes. This is because it is a potent antioxidant that contains the plant compound cinnamaldehyde. A natural vasodilator, it relaxes the smooth muscle cells within the artery walls. According to a systematic review and meta-analysis, the short-term consumption of cinnamon is linked to a significant decrease in blood pressure in both prediabetes and type 2 diabetes patients. This spice comes from India; unsurprisingly, you can find it as an ingredient in many local delicacies such as curries. The aromatic herb is full of the blood-pressure regulating minerals magnesium and potassium. An Indian study found that participants with primary hypertension who consumed three grams of cardamom powder every day over a period of three months had their blood pressure lowered. Be aware that you can bake cardamom into many dishes such as cookies, jams, pies, and even cocktails. Because omega-3 fatty acids are so beneficial, taking flaxseed, which contains a lot of the plant-based alpha-linolenic acid, is a great idea for your cardiovascular system. Many studies have shown the anti-hypertensive effects of a diet rich in the essential fatty acids. Flaxseed is an antioxidant that could help reduce blood cholesterol levels, stabilize blood pressure, and improve your body’s glucose tolerance. Research findings suggest eating 15 to 50 grams of ground flaxseed daily to get the maximum benefits. Easy to obtain, and easier to use, garlic is a fantastic addition to any kitchen, before you add in medical benefits that have been utilized for thousands of years. One powerful sulfur compound found in garlic—allicin—may lower blood pressure by triggering vasodilation. Research published in the Integrative Blood Pressure Control journal in 2014 suggests that aged garlic extract could lower uncontrolled blood pressure by 10 mmHg systolic and 8 mmHg diastolic. This effect is similar to standard blood pressure medication. However, be mindful that many experts say allicin is only produced when chewed or crushed, and garlic capsules won’t suffice. You only need to take about half a clove of fresh garlic to get these health benefits. Ginger is a spice that has uses in treating hypertension because it is believed to improve blood circulation, and possibly lower cholesterol. Researchers studying the cardiovascular effects of ginger found that the crude extract triggered a fall in the arterial blood pressure of rats. The study, published in the Journal of Cardiovascular Pharmacology, attributed the anti-hypertensive effect to the herb’s calcium channel-blocking abilities. While it is often found in Asian dishes like Chinese food, it can be sliced or grated into almost any dish to reap health benefits. A common flavoring in savory dishes like soups or stews, celery has been used by the Chinese for centuries to treat high blood pressure. As a natural diuretic, celery removes excess fluid from blood, which lowers stress against arterial walls. This in turn, lowers your blood pressure. Either four celery stalks a day, eight teaspoons of celery juice thrice daily, 1,000 mg of celery seed extract twice daily, or half to a full teaspoon of celery oil three times daily can help you. Lavender is an antioxidant that has relaxing effects and may treat hypertension by working as a vasodilator. To use lavender in the reduction of blood pressure, either drink it in tea form, or rub it on the body in essential oil form. Used often in traditional Chinese medicine, this woody vine is an antioxidant that lowers blood pressure through the calcium channels of the body. The bark of the vine can be used to make tea, with root and bark extracts often available as a liquid or in capsules. Also known as red sage, this is a Chinese herb that improves blood flow, and can be used to treat cardiovascular diseases. The active ingredient in danshen is tanshinone IIA, which can potentially reduce blood pressure. It is available in pill form. Mistletoe extract has been used in traditional Chinese medicine to treat low blood pressure. It may help you achieve a slight reduction in blood pressure. European mistletoe must be used, as American mistletoe is considered unsafe for medicinal use. Also remember that raw mistletoe is dangerous to consume. This perennial herb is found throughout Asia, typically growing at high elevations near the edge of forests. A 2017 study by the Tropical Journal of Pharmaceutical Research has shown “significant antihypertensive effects” of Gastrodia elata, owing to its antioxidant properties. A plant in the dayflower family, Virginia dayflower is found throughout the mideastern and southeastern United States. The plant as an extract has been shown to lower blood pressure in Guinea pig aortic rings by a significant amount. Nightshade, also known as wild tomato, is part of the Solanaceae family of plants. Of these, very few are actually edible. The root is used in traditional medicine in Paraguay to treat hypertension. Rauwolfia was once used commonly by doctors in India and North America before adverse side effects slowed its use. Be sure to use the correct dosage; typically, a very small amount is best for those using rauwolfia to treat low blood pressure. Taking the extract made from the leaves of the nela nelli plant could potentially reduce blood pressure. A study performed on male rabbits who were given the nela nelli extract demonstrated significant decreases in diastolic, systolic, and arterial pressures. Extract from moringa leaves that was fed to rats caused a fall in blood pressure. However, the improvement was only temporary. Moringa does contain over 92 nutrients, including a high source of vitamin E and iron. Roselle is actually one of the most studied plants in respect to its ability to treat hypertension. Clinical trials of the plant extract in humans have shown that it may lower blood pressure on a level comparable to pharmaceutical angiotensin-converting enzyme (ACE) inhibitor captopril. There was a definite demonstration of lowered blood pressure in dogs that were injected with an extract from the leaves and stem of Osbeck. This may be attributed to the inhibition of the cardiac cyclic AMP phosphodiesterase. Oregano itself contains carvacrol, which has proven effects when reducing blood pressure. When coleonol was isolated from karpuravalli and given to cats and rats, it was shown to lower blood pressure. Large doses of coleonol have a depressant effect on the nervous system. If taken in the correct dosage, many of the aforementioned herbs have the potential to treat hypertension. Be aware that in many cases, the benefits are limited and should always be combined with other methods (exercise, nutrition, and lifestyle changes) in order to see lasting or significant improvement in cardiovascular health. Remember to tell your medical doctor about any herbs or supplements that you are taking, as they may have interactions with other medications or have other side effects. In fact, according to a paper published in the Anesthetic Surgery Journal, herbs like garlic and ginseng and should be halted two weeks before any surgery because they may affect the heart, increase bleeding, or interfere with anesthesia. Tabassum, N., and Ahmad, F., “Role of natural herbs in the treatment of hypertension,” Pharmacognosy Review, Jan.-June 2011; 5(9): 30–40; https://www.ncbi.nlm.nih.gov/pmc/articles/PMC3210006/, last accessed January 8, 2018. “10 Best Herbs to Lower High Blood Pressure,” Organic Facts, November 15, 2017; https://www.organicfacts.net/herbs-high-blood-pressure.html, last accessed January 8, 2018. Umar, A., “Antihypertensive effects of Ocimum basilicum L. (OBL) on blood pressure in renovascular hypertensive rats,” Hypertensive Research, Jul. 2010; 33(7):727-30; https://www.ncbi.nlm.nih.gov/pubmed/20448636, last accessed January 8, 2018. “Calcium channel blockers,” Mayo Clinic, June 24, 2016; https://www.mayoclinic.org/diseases-conditions/high-blood-pressure/in-depth/calcium-channel-blockers/art-20047605, last accessed January 24, 2018. Akilen, R., “Effect of short-term administration of cinnamon on blood pressure in patients with prediabetes and type 2 diabetes,”Nutrition, Oct. 2013; 29(10):1192-6; https://www.ncbi.nlm.nih.gov/pubmed/23867208, last accessed January 8, 2018. Xue, Y., et al., “Vasodilatory effects of cinnamaldehyde and its mechanism of action in the rat aorta,” Vascular Health and Risk Management, 2011;7:273-280; https://www.ncbi.nlm.nih.gov/pubmed/23867208, last accessed January 24, 2018. “9 Proven Herbs That Lower Blood Pressure,” Sepalika, September 30, 2017; https://www.sepalika.com/heart/herbs-lower-blood-pressure/, last accessed January 8, 2018. “Herbs to Lower Blood Pressure,” Healthline; https://www.healthline.com/health/high-blood-pressure-hypertension/herbs-to-lower, last accessed January 8, 2018. “Eating flaxseed may lower blood pressure” American Heart Association, November 5, 2012; http://www.heart.org/HEARTORG/News/Global/SimpleScience/Eating-flaxseed-may-lower-blood-pressure_UCM_446258_Article.jsp#.Wjdzh2GWa1M, last accessed January 8, 2018. “Heal Yourself with Garlic” Cosmo Total Health, March 17, 2017; http://www.cosmostotalhealth.org/2017/03/17/heal-yourself-with-garlic/, last accessed January 8, 2018. “Garlic,” BP120; https://bp120.org/BP120Org.Reference.BP120ArticleGarlic.html, last accessed January 8, 2018.